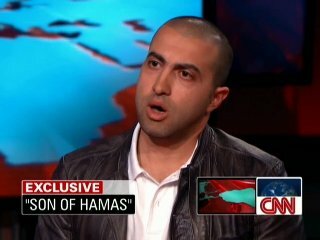 Yousef left Hamas and spent 10 years working with Israeli intelligence, helping prevent several terrorist attacks. He has also abandoned Islam for the Christian faith, prompting his Muslim relatives to disown him. Israel National News: When he was arrested by Israeli security services for purchasing guns, he was exposed to Hamas brutalities in prison. His experiences disillusioned him. He ultimately left Islam in favor of Christianity, and began working against Hamas with Israeli agents. In mid-June, one of Yousef's Israeli handlers – Gonen Ben-Yitzchak – broke his cover in order to testify on behalf of Yousef at an immigration hearing. Ben-Yitzchak had left the service four years earlier. "Yousef should be a textbook case for political asylum, but the Obama Department of Homeland Security sees it differently. Its briefs for his deportation allege that he provided "material support" for Hamas -- with his book as the main evidence against him. Yet the DHS' briefs are laughably incomplete -- for example, citing his leading of five Jordanian suicide bombers to a safe house while leaving out the key fact that he was setting a trap for them. While DHS lawyers insist that Yousef was a Hamas member, Hamas issued a statement: "Mosab was not an active member of Hamas or in any of its military, political or religious branches, or any other body." Israeli intelligence agrees. In a sworn statement filed with a federal immigration court, Yousef's Shin Bet handler said: He "was never a member of any terror group." What's going on? Yousef's attorney, Steven A. Seick, says that Kerri Calcador, the senior DHS attorney targeting Yousef, told him she'd never agree to asylum, and would appeal if the judge grants it. She said that she had "marching orders from DC," Seick told me. Seick believes that Yousef is a pawn in Obama's Middle East strategy -- his life to be traded for better relations with the Muslim world. Yet Yousef's problems with DHS began just weeks after Arif Alikhan was sworn in as a top official at DHS. Alikhan recently spoke at a fund-raiser for the Muslim Public Affairs Council, which terror analysts have linked to the Muslim Brotherhood -- which also fathered Hamas. Wednesday's immigration-court hearing may not decide Yousef's fate: Lawmakers of both parties are working to save this hero. Let's hope they succeed. Deporting Yousef is not just wrong, but foolish: It will discourage others from risking their lives to save innocents. Has the Obama administration no shame?" Atlas Shrugs has more detail regarding the curious appointment of the C.A.I.R.-endorsed Mr. Alikhan, first as Deputy Mayor of Los Angeles, later as Assistant Secretary at DHS. Ted Belman has more on Obama's outreach towards Hamas in the American Thinker. Thank God he will get asylum, finally DHS does the right thing.